Why E- Wedding Invitation Cards are A Smart Choice? Many couples are turning to e-wedding invitation cards, not only because they are easily accessible by the guest but it is one smart choice. In the era of absolute digitization, Indian weddings are no left behind. But what makes it so popular among the couples? What makes it the preferred and the smart choice of couples? One of the many reasons that make e-invitation a smart choice is that it can help you save money. With the paper invitation, you have to spend thousands on unique design, expensive material, printing, and posting. There is no such scenario with e-wedding invitation cards. Using them is one smart choice to save all those thousands of bucks which can be utilized for so many other things. Are you sure you remember the exact address of your maternal aunt? With paper invitations, there are strong chances of delivery mistakes. Sometimes the delivery is so delayed that they probably get your invite after the ceremony. With e-wedding invitation cards, you don’t have to stress out over who’s received your invitation and who didn’t. Moreover, if you send the invite on the wrong email address, you are notified immediately which also makes e-invites one smart choice. Well not immediate but faster to be more precised, yes you can easily get faster responses on e-invites. If you are planning a destination wedding and are looking for booking the hotel, you need to know who all are coming. With paper invites, you have to wait for long for a response. With e-wedding invitation cards, all the recipients who are coming can RSVP within a few minutes. That’s super fast and convenient too. Indian weddings are nothing less than an extravagant occasion and the guest list seems to be never-ending. If you too are a bit clumsy when it comes to keeping things organized, e- wedding invites make one of your tasks easier. It helps you to stay organized, by enabling you to store all the information of the guest at one place. An organized guest list with all the necessary information saves you from a lot of hassle like in a literal manner. We live in the digital era, so why not make the optimum use of it. Everybody is present in this digital space on one or several other platforms. With e-wedding invitation cards, you can reach all your family and friends digitally. If you’re concerned about the older relatives, you can reach out for someone who can help them with this. And to be honest, the older relatives are more engaged on these platforms, so overlooking the option of e-invites in the prevailing era is not a smart choice. Not only for all these reasons, but e-invites are also trending too. Not only they are environmentally friendly and save a lot of paper, but they look just as nice as paper invitations. They don’t have to be a boring formal invitation. You can incorporate designs by yourself and add a personal flair. 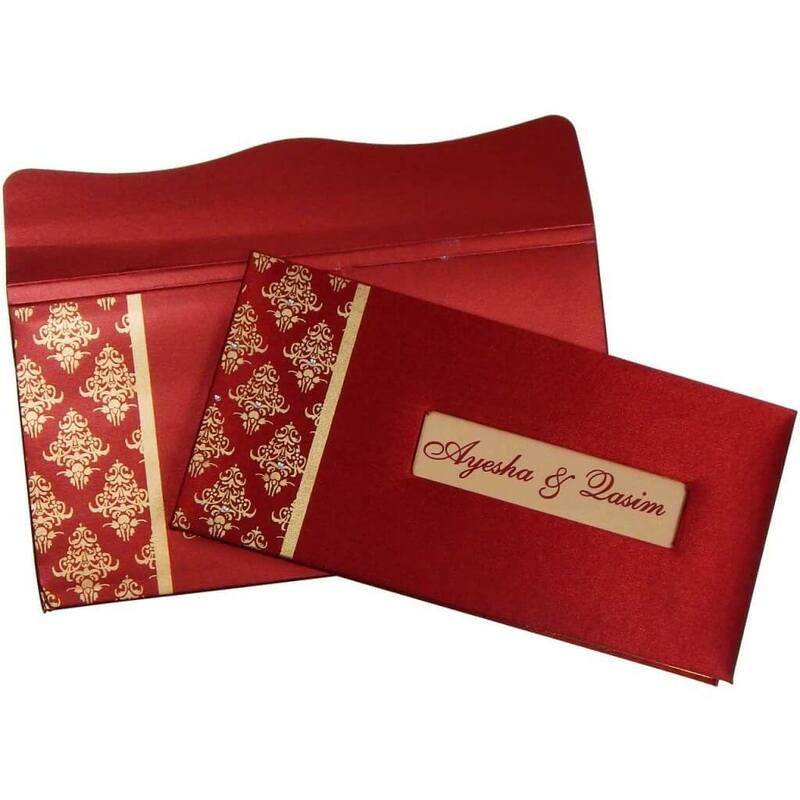 With many designs for Indian wedding cards, you surely will find your pick for an exceptional e-invite. You are about to embark on this new and exciting journey, so why not begin it with something new and trending.